Living on a boat is a dream shared by millions of people. 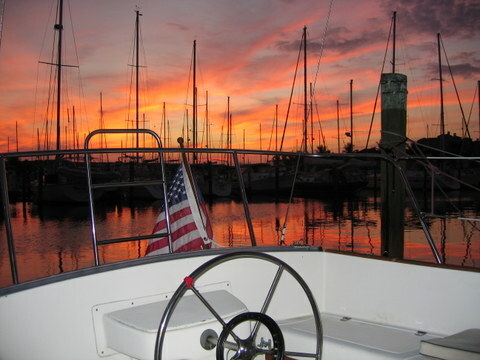 The goal of this website is to help you learn some basic facts about living aboard a boat. We have tried to answer in advance some of the questions you might have about the lifestyle. I learned most of the answers myself by expensive and painful trial and error. Even so, it was a lot of fun. Most people who have lived aboard did not realize they were pioneers of the "tiny home" movement, but indeed they were. They were the trail blazers of the minimalist lifestyle and living off the grid. This website is about living on a boat, not necessarily cruising on a boat. There are plenty of websites and published books that will teach you the basics of cruising. This website is more for the novice who is trying to decide if living on a boat makes sense. There are seminars and courses that will give you hands on instruction about cruising. Some of this basic cruising knowledge will serve you well as a liveaboard even if you plan to stay in the marina all the time. Living aboard a boat was a dream of mine for years. I achieved it two different times in my life for extended periods. 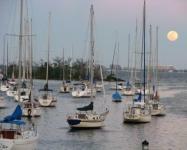 In my case, I also wanted to do some cruising so that consideration drove my choice of boats. The first time was on my CSY33 "Silverheels". She was a 33 foot cutter with a deck house that let plenty of light below and had 6 foot 7 inches of headroom. I love a pilot house on a sailboat for that reason; motorsailers usually have them too. The second time was on my Island Packet 26 "AWOL". Although it was 7 feet shorter on deck than Silverheels, it was pretty close to having the same waterline length. That and it's beamy width made it almost as roomy below as Silverheels, but with only about 6 foot 2 inches of headroom. I've also enjoyed "living aboard" my various boats many other times during long cruises, vacations and on weekends. Boats have also served many times as my office and guest room away from home. I have a lot of experience around boats and love them, especially sailboats. 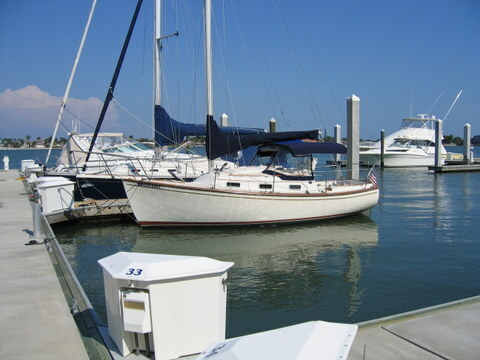 All of my experience living aboard full-time has been on sailboats berthed in Florida marinas. That's why this website is Florida Centric. It seems to me that much of the art of living a good life involves balancing thinking and feeling. Too much of either can get in the way of a life well lived. As an engineer I've done a lot of thinking, but have also been lucky in getting in touch with my feelings. The thinking part says that living on a boat is cramped, confining, damp, expensive and invites a feeling among your colleagues that you are less than stable. This might not be good for business if you are a professional who has to dress up and go to work each day. I have been accused now and then by coworkers ashore of using diesel fuel for after shave lotion. The thinking part asks where there are anchorages or marinas that are safe and close to amenities. How much will it cost to maintain your boat? How much will a marina or mooring cost? How about insurance? Financing? And so on. You will probably make a list of the pros and cons of living aboard and assign points. It doesn't matter what you do because the feeling part is going to win. The feeling part enjoys sitting in the cockpit after a hard day at work unwinding with a cocktail. Your old friend the green heron rides on your stern line bobbing up and down and spearing fish on the downstroke. A mullet jumps up out of the dark water and lands with a splash. A large pelican spots him and crash dives into the water to fill his big beak with a tasty meal. The breeze kicks up and your boat begins to rock gently in her slip. The halyards all around the marina start clanging against the masts and sound like distant church bells. The rain comes crashing down and you go below to read a book, watch TV or listen to music. The rain beats a tatto on the roof of the cabin but you are snug and secure and all is well. You can hear the shrimp nibbling on the hull of your boat. It's just you and nature. There is a sense of freedom that you just can't get living on land. Your mind is limited only by your imagination. If you can figure out how to work at home, or if you win the lottery, you can live anyplace there is water and a place to berth your boat. This includes most of the world. Living on a boat defies rational analysis. It can be just as expensive or more so than living on land, and it can be real inconvenient. Unless you have a huge yacht you will learn where the best laundromats in town are located. You will get rid of all your furniture and most of your books, knick knacks and art. You will learn how to cook dozens of varieties of one pot meals. You will learn that every labor saving mechanical and electrical device comes with an energy and maintenance price to pay. You will keep your clothing wardrobe to a minimum. But when all is said and done, you will feel it was not a sacrifice, but a logical result of the floating freedom lifestyle you have chosen. Enjoy yourself on your journey through these web pages, and I hope what you learn will help you make the right decision. Liveaboard sleeping is something everybody needs. It's important to get the right kind and size of berth to sleep on. The liveaboard galley is where you create nourishment for your body and soul. 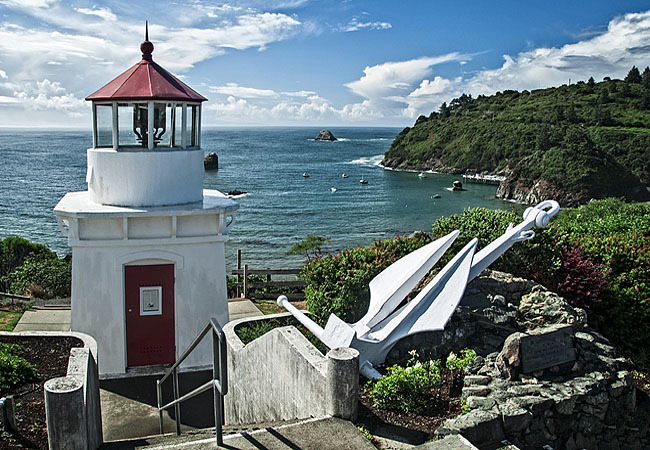 Now that you've made the decision to live aboard, here are some suggestions. Over 4,000 fans can't be wrong. Join them to see if living on a boat is the life for you.